30% keyboard from keeb.io. 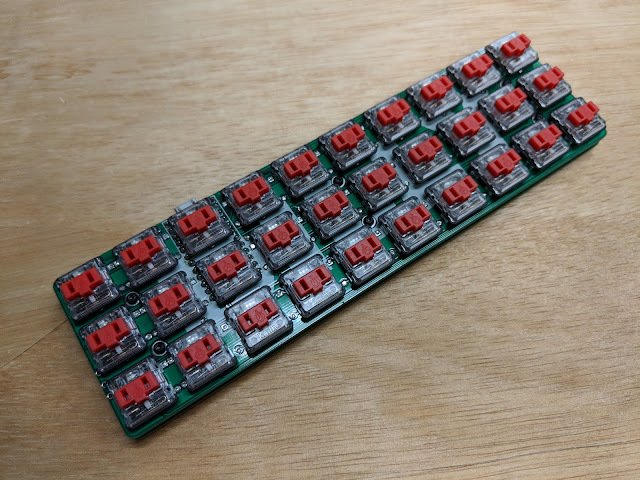 Kailh red linear low profile "Choc" switches. This is the first time I am using the new Kailh low profile switches. 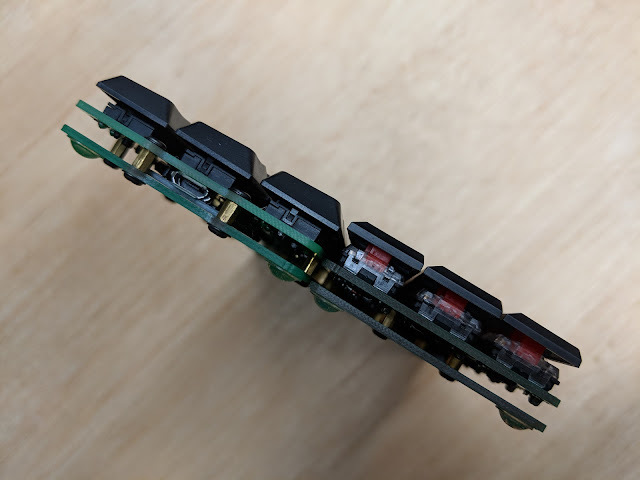 They are similar to the Cherry ML switches, but the pinout and pin spacing is different. They also have a clear top and a hole for a LED placed under the switch. 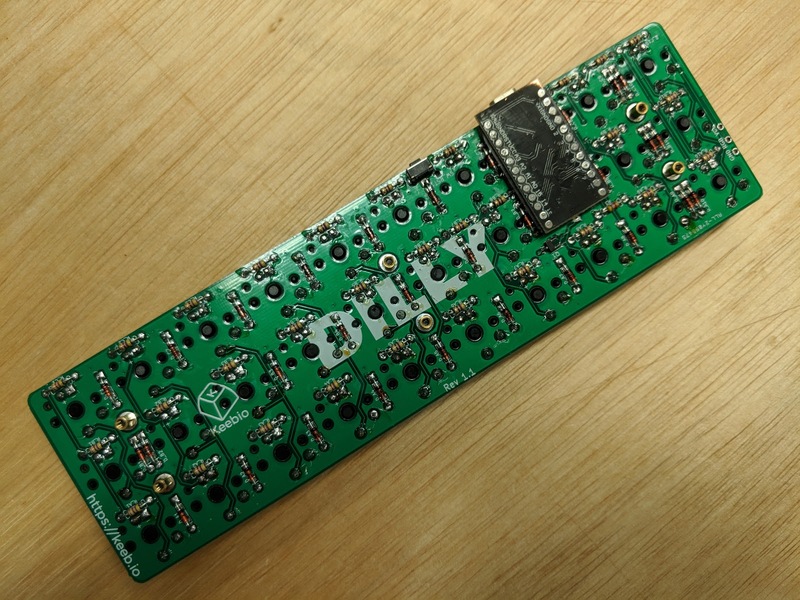 The Dilly PCB comes as a set of top PCB and bottom PCB. 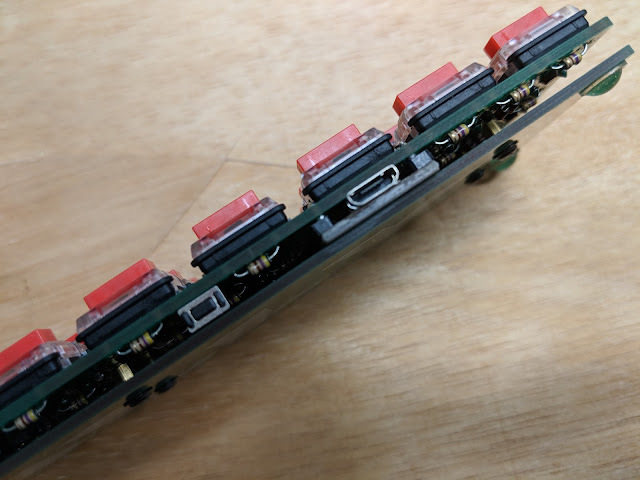 They are connected with M2 spacers and screws that are included. 1n4148 diodes, a MOSFET, a single 4.7K resistor, and a reset switch are also included. The MOSFET is for powering the LEDs, the single 4.7K resistor (R3 on the PCB) is a pull down for the MOSFET. You will need your own Pro Micro, switches and keycaps. 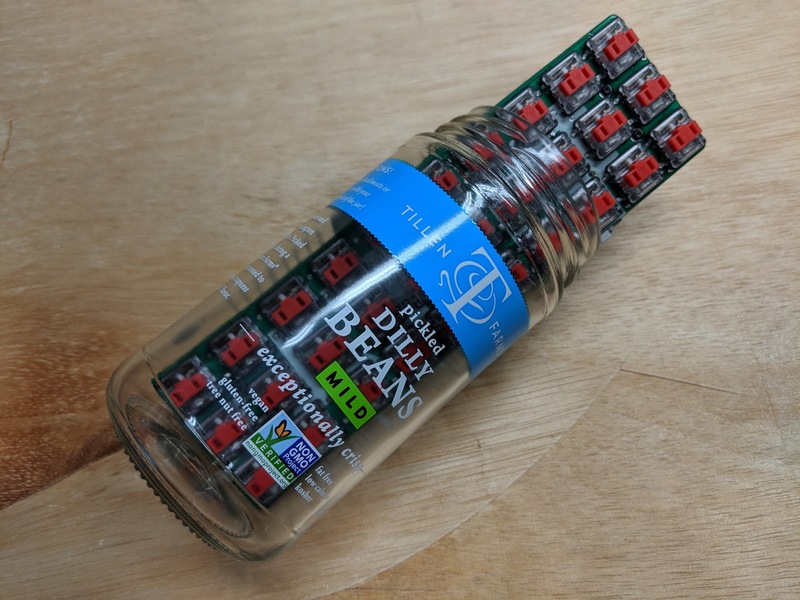 As well as resistors and LEDs if you want them. Top of the assembled board. The diodes and resistors were soldered on the bottom of the board. 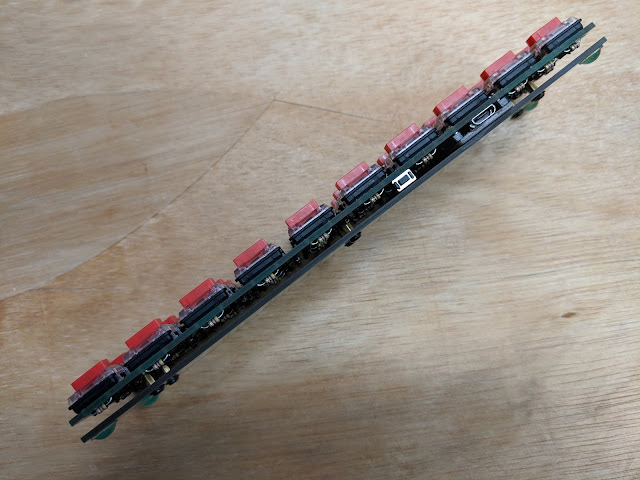 Bottom PCB. 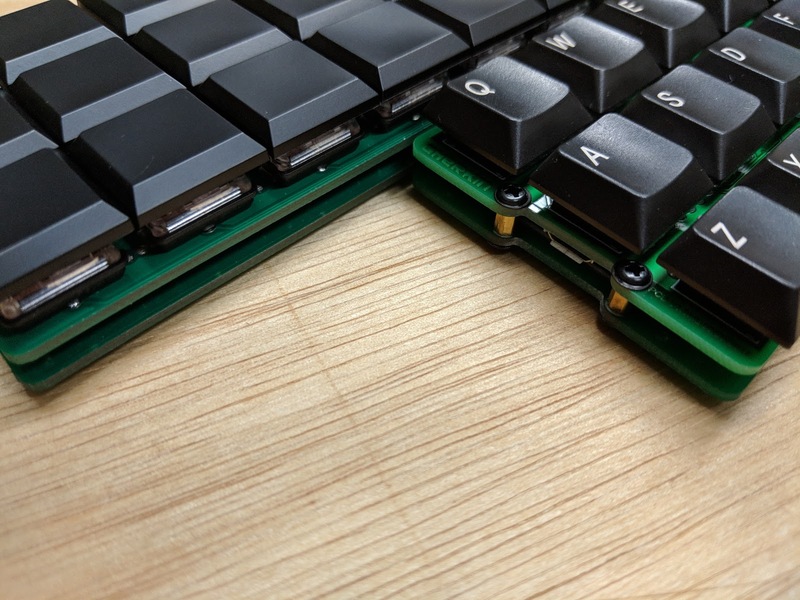 Is is just a flat PCB with no circuitry. 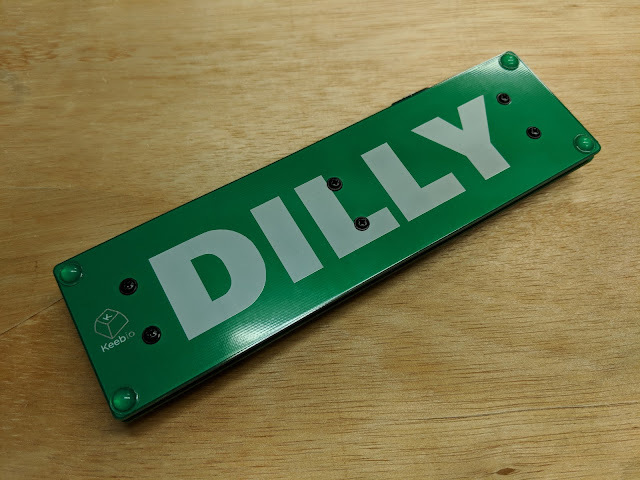 One side is blank and the other has the DILLY logo. I used my own 4mm M2 spacers and screws. The included spacers included in the kit are 5mm. 4mm is as short as will fit. On one side are three solder pads for ground, VCC and a data pin (D3) for a WS2812b RGB strip. The right angle reset switch is easy to press from the side. 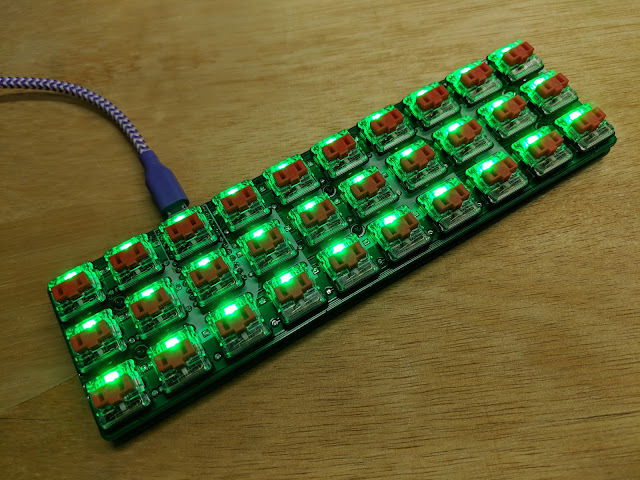 I installed 470ohm resistors and green 2x3x4mm LEDs. With the default firmware you hold down "B" and tap "Z" to cycle through brightness. Bottom of the board. The resistor for the MOSFET is labeled R3 and is below the Pro Micro. The positioning the the Pro Micro is a little odd. It sticks out past the edge of the PCB. This does allow the USB connector to clear the LED pads so they don't short out. Blank black keycaps. 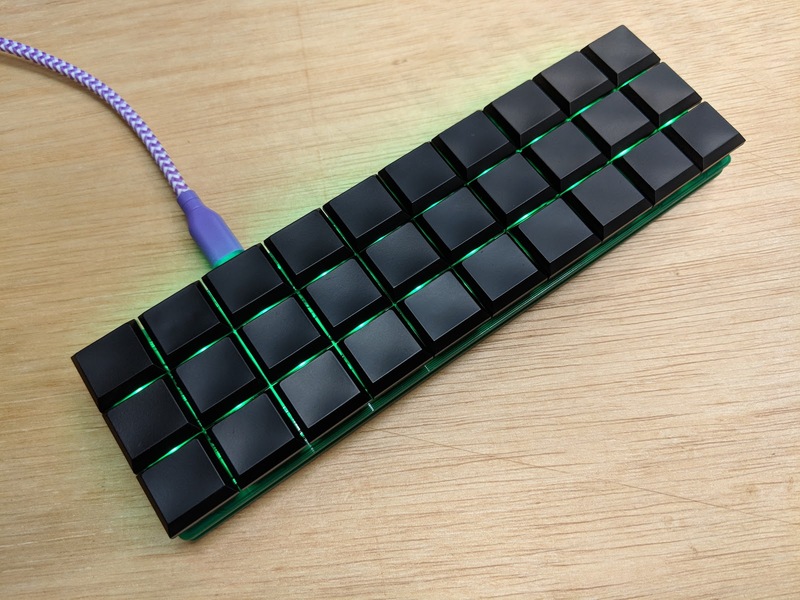 The switches and keycaps are from Novelkeys. 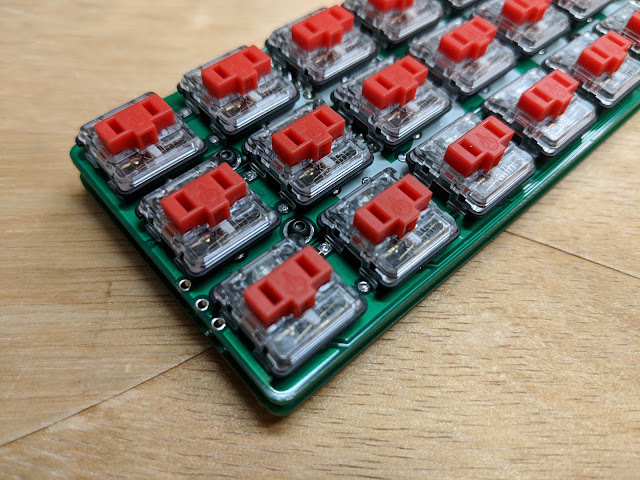 There are currently very few choices in keycaps for Kailh low profile switches. It's either black or beige, and they also come in a 104 keyset with legends. Next to the Cherry ML Gherkin. It is about 10mm wider. The PCB assembly is similar, two PCBs connected by spacers. Both are using 4mm spacers. 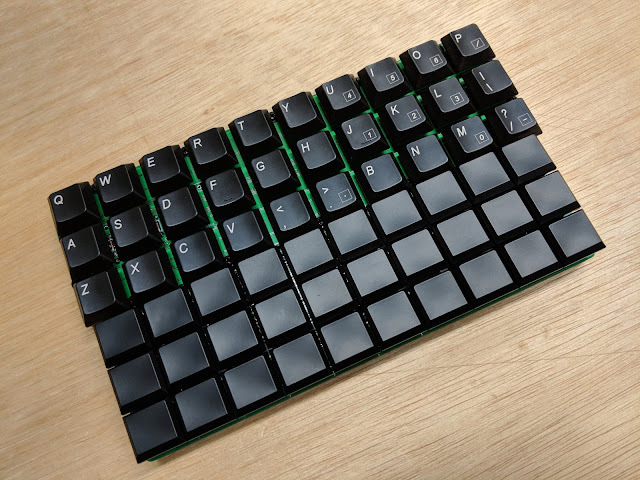 Hard to see but the Kailh switches are taller than the Cherry ML switches. The Dilly is slightly taller than the Cherry ML Gherkin.